An Educational Exhibit for People of All Ages! What is the Mega Brain’s purpose? To help YOU learn about the signs and symptoms of a STROKE! 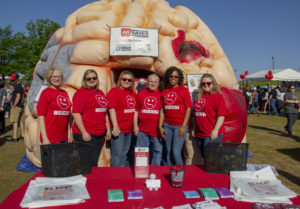 The Mega Brain can be a great tool to help the general population learn about the signs and symptoms of a stroke. 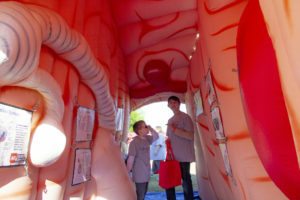 The Mega Brain also offers insight to other conditions and diseases of the brain. 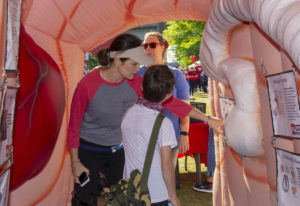 The Mega Brain provides a guided tour of the outside and inside of the brain and an opportunity to ask questions about stroke signs and symptoms. The request must be submitted a minimum of 60 days prior to the event. Please allow at least two weeks to determine availability of the Mega Brain. The request must have all fields completed or it will be discarded. Please provide the event’s exact address. We know it is difficult to estimate the number of attendees, but please do so in a conservative way. An unrealistic estimate of attendees could result in the brain not returning to that event because of rules regarding the discrepancy in attendance. If the requesting entity does not acknowledge the Mega Brain approval within two weeks, the request will be discarded. There must be a designated coordinator/spokesperson from the requesting entity to manage the event. There must be a minimum space of 17ft high x 24ft long x 24ft wide for the setup of the Mega Brain. The floor must be swept and cleaned prior to the Mega Brain’s arrival. There must be access to a 110 grounded electrical outlet. A 20amp dedicated fuse is recommended. There must be a minimum of 2 volunteers from the requesting site to assist in setup and teardown of the exhibit. The Mega Brain weighs 90lbs, so please make sure the volunteers have the capability to help carry that load. Those and/or additional volunteers will also need to assist in crowd control during the event/function and be available to relieve the Mega Brain manager if a quick break is needed. The coordinator/spokesperson/requester must be available the day the Mega Brain is present or have a well-informed substitute and provide their contact information to the Mega Brain manager before the day of the event. Please note that guided tours are preferred, and a schedule must be sent 2 weeks prior to Mega Brain arrival. The Mega Brain will be set up the day of the event (some exceptions can be made). Setup requires a minimum of 30 minutes, please have your volunteers present at this time. It takes roughly 30 minutes to deflate, pack, and load the exhibit into the van. For safety concerns, no children are to be present during the setup or takedown of the exhibit. The volunteers must be present. There must be adequate space for set up and walking space around the exhibit. It is recommended that there be 5 feet around each side in addition to the dimensions aforementioned. The Mega Brain’s preferred set up space is indoors, if outdoors is all that is available, a detailed description of the space must be provided before approval of the event. Please see Outdoor Use below. The Mega Brain will not be taken down for daily activities that take place in the dedicated space. Please make alternate arrangements for those activities. Although the name may indicate otherwise, this “Mega” Brain is not indestructible. It can withstand the stress of handling, packing, and traveling all over the state when done so in a proper manner. No student/participant is allowed to climb, play, punch, sit, jump, draw on, or any other form of vandalization. Unfortunately we have to make note of this because all of these things have happened. This Mega Brain is an educational tool, not a bouncy house. Any damages that occur from intentional mishandling, carelessness, or roughhousing will be the responsibility of the entity that requested the brain. Any items that are missing at the end of the day will also be the responsibility of the requesting entity as well. Each entity that requests the Mega Brain exhibit assumes sole responsibility for any damages or injury caused by assembly, disassembly, or use of the exhibit. Illness of the Mega Brain Manager: It is our hopes that the Mega Brain will arrive at your entity on time and as scheduled. There are occasions where only one Mega Brain Manager is available to attend, and they are solely responsible for driving the Mega Brain to the event. If an illness, emergency, or other situation occurs, you will be notified immediately. Weather: If there is a threat of inclement weather, the event will need to be rescheduled. Because we personally travel with the Mega Brain across Arkansas, we do not want to endanger the lives of our staff if inclement weather may occur. Please be considerate and understanding if your event needs to be rescheduled. Outdoor Use: If you request to set the brain up outdoors, please keep in mind the weather. During the summer, please have a shaded spot available for the brain and staff, in addition, please make sure a cooling station and water is available. In the event of rain, please have an indoor location available that is close to the original location, or cancel you Mega Brain request. Cancellation of the requested entity/ venue: If the Mega Brain event must be canceled for any reason other than those aforementioned, please do so in a timely manner.